An intrepid band of Bexhill Rotarians set out from Catsfield on their Annual New Year Walk. The Rotarians were joined by their ‘other halves’ and a few dogs. 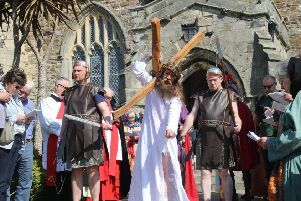 Rotarian Stephen White said: “Unlike last year, when the heavens opened and the party had to bet a hasty retreat to a local hostelry, the weather was pleasantly equable for the time of year. “The group spent an exciting morning trooping across fields and clambering over stiles watched by a bewildered flock of sheep who obviously wondered who was interrupting their day. Bexhill Rotary Club was formed in 1923 and has been serving the local community for more than 93 years. They hold a number of events during the year to raise money for good causes. Rotary Club members were out in force collecting for charity over the Christmas period and the club is preparing for its popular Ale and Arty beer festival, which takes place at the De La Warr Pavilion. The Club also holds a successful Annual Golf Day which has just celebrated its 25th year. Projects the club was involved in last year included renovating a summer house for a local primary school. Bexhill Rotary Club always welcomes new members and further details of the activities and membership can be obtained from the secretary, Brian Cope on Bexhill 732895.